Paprocany Lake is located in Tychy, Poland and it has always been very popular with the town’s inhabitants who go there to relax and enjoy nature and the outdoors in their free time. As a result of the redevelopment project in 2014 by the RS + Robert Skitek studio, going to Paprocany has become even more enjoyable. The design focused on the enhancement of the location, bearing in mind that the lake is located where there is a sports recreation center, too. It was created along the shore of the lake, made with natural materials, to emphasize and enhance the natural features of the facility. On one side, it goes down almost far enough to touch the water, while on the other side, it is connected with the cycling and racing track. 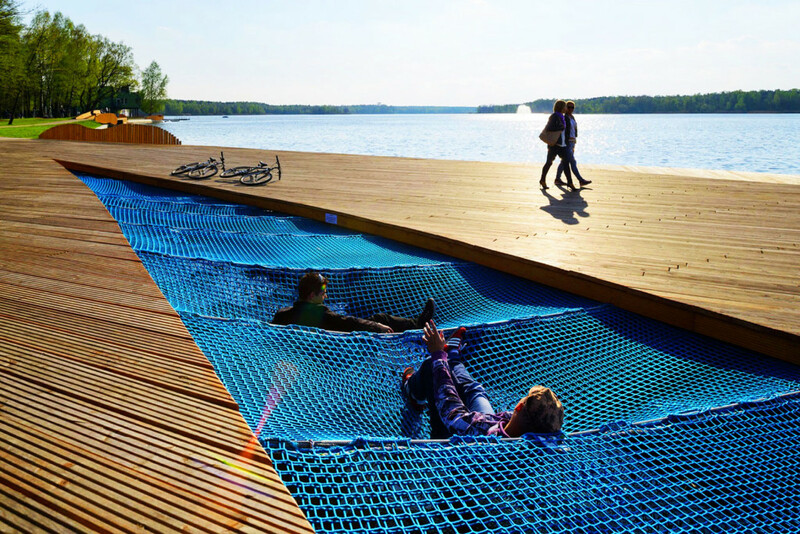 A very special characteristic of the design, which I find extremely interesting and stimulating, is the open area right above the water, covered with an elastic net, where you can kick back, relax, and look at the sky. What do you think about it? Would you like you to have an open space like this in your city? What did you like most about this redevelopment?